Easy Wash and Dry. No Stress. No Mess. Close to the Amherst Walking Trails. We will be having a booth at The Amherst Sustainability Festival. See everyone on Sunday April 28, 2019 for our regular schedule!! Relaxed Environment. Friendly Place with Friendly Service. your dog in an enjoyable environment. muddy paw prints and dirty bathtubs! 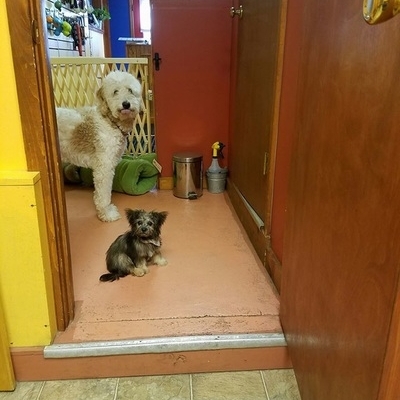 Amherst Dog Wash is a place where people take great care of their dogs and themselves while building a strong local community. We are totally cage-free! Our goal was to create a grooming experience that our four-legged loved ones would actually enjoy. We moved away from the industry standard assembly line style grooming and work on each dog one at a time totally cage-free. 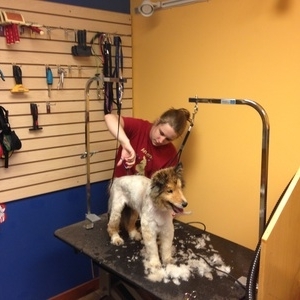 This approach to grooming ensures that your pup's styling takes just a few hours rather than the whole day. We are 'by appointment only' including weekends. That means your dog will not be sitting around in a cage all day. That means your dog is treated with respect and patience in a stress-free environment. All Natural Soaps & Shampoos. You can purchase Ben's Bed's for Dogs. Our locally made beds from 100% recycled materials. Looking for the perfect gift for your dog? We sell a variety of dog toys that your pet will love! All of our products are made in the U.S., and many of them come from right here in New England! We also have gift bags available so you can mix and match toys, and gift certificates for the dog who has everything! Every month we provide new discounts and specials!